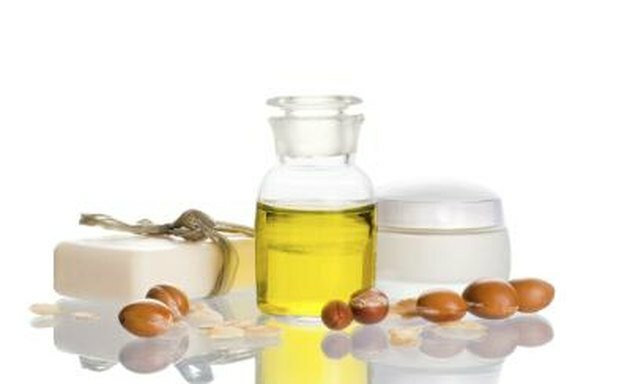 Both olive oil and vitamin E are used extensively in skin care. Both oils have purported moisturizing benefits. However, you need to make sure that you are purchasing the right type and quality of olive oil and vitamin E in order to benefit from the properties of the oils. Some oils are inferior and will not perform in the same way as quality oils. Historically, olive oil has been used longer in skin care than vitamin E. However, vitamin E is predominant in many skin-care products today. Olive oil is available in various formats. It is extracted from the fruit of the olive tree. According to Len Price in “Carrier Oils for Aromatherapy and Massage,” the best olive oil is extra virgin olive oil, followed by virgin olive oil. Extra virgin olive oil is obtained at the very start of the extraction process, from the first press, and consequently retains the most therapeutic properties of the plant. Subsequent pressings retain less therapeutic properties, and olive oil that is obtained after several pressings might be mixed with water and pulp too. Vitamin E oil is found in several vegetable oils. Vegetable oils that retain the highest quality of vitamin E are cold-pressed. Vegetable oils that are subjected to a high level of heat in the extraction process do not retain the same therapeutic properties. Vegetable oils that contain high levels of vitamin E include wheatgerm oil, carrot oil, sunflower oil and flaxseed oil. Price states that olive oil has good moisturizing properties and is beneficial for dry skin. Consequently, it is found in many skin-care products. According to The Daily Green website, olive oil has excellent moisturizing benefits because it contains linoleic acid, which prevents the evaporation of water. Use olive oil to moisturize nail cuticles, maintain elasticity of your skin and maintain a smooth complexion. According to James F. Balch and Phyllis A. Balch in “Prescription for Nutritional Healing,” vitamin E promotes healthy skin and hair, slows down aging and might possibly prevent age spots. Vitamin E is a strong antioxidant that helps to prevent cell damage by inhibiting the formation of free radicals and the oxidation of fats within the body. You will find it in many skin-care products because of its moisturizing and antioxidant properties. Both olive oil and vitamin E have valuable moisturizing properties. Although olive oil has traditionally been used for centuries in skin care, vitamin E has additional therapeutic properties that improve the quality of your skin, such as antioxidant properties. Olive oil is a vegetable oil in its own right, whereas vitamin E is found in several vegetable oils. Both oils have beneficial moisturizing properties for skin care. Is Vitamin E Oil & Aloe Vera Good?